Middle adulthood is particularly relevant to the central question of when cognitive decline begins. The fact that mean level change for some cognitive functions tends to be small or absent until or just past late midlife may give the impression that cognition in middle adulthood is of little interest in its own right. Longitudinal studies indicate linear declines in episodic memory from age 60, but there is also evidence of declines occurring earlier in processing speed and spatial processing. Working memory and executive functions represent cognitive abilities that are very important for effective daily functioning, and they are also among the more age-sensitive cognitive domains. 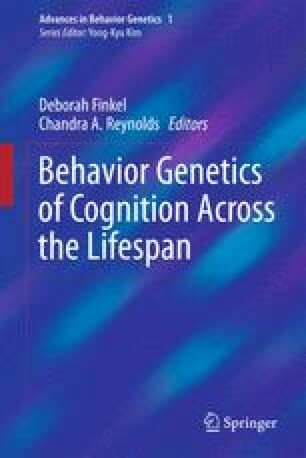 In this chapter, we first address some important general issues with respect to behavior genetic research on cognition in middle adulthood. Next, we review some of the extant empirical findings, focusing first on general cognitive ability and then on specific abilities. We conclude that middle adulthood remains an understudied period in phenotypic and behavior genetic studies of cognitive aging. Further study focused specifically on middle adulthood is needed for understanding cognitive changes during midlife itself and for understanding midlife cognition as a “gateway” to cognition in old age. The available data suggest that there are some cognitive changes during midlife itself. However, because these changes tend to be small on average, a greater focus on subgroups of individuals who are manifesting earlier declines will be important. Funding for this work was provided by grants from the National Institute on Aging (R01 AG018386, R01 AG018384, R01 AG022381, R01 AG037985, and R01 AG022982). This material is also the result of work supported in part with resources of the Center of Excellence for Stress and Mental Health at the VA San Diego Healthcare System. The Cooperative Studies Program of the Office of Research and Development of the US Department of Veterans Affairs has provided financial support for the development and maintenance of the Vietnam Era Twin (VET) Registry. Numerous organizations have provided invaluable assistance in the conduct of this study, including: Department of Defense; National Personnel Records Center, National Archives and Records Administration; the Internal Revenue Service; National Opinion Research Center; National Research Council, National Academy of Sciences; the Institute for Survey Research, Temple University. Most importantly, the authors gratefully acknowledge the continued cooperation and participation of the members of the VET Registry and their families. Without their contribution, this research would not have been possible.